Henchgirl began as a webcomic, and here the entire saga is collected in one volume. The story follows a young woman named Mary Posa, who is physically quite strong and works in the Butterfly Gang run by supervillain Monsieur Butterfly. Even though she makes much money from crime and is employed by a criminal, she is not really evil, just sort of aimless. She lives with a couple of roommates who know what she does (and do not hold it against her). In the end, this book is less about its superhero trappings and more about personal relationships and observations about trying to get by in the world. Sure, comic book style action happens: banks get robbed, heroes clash with villains, aliens invade the Earth, but the heart of this book is seeing how the various characters react to various events and bounce off of each other. Many of these scenes are actually played for laughs, and some are hilarious. In addition, this book is also pretty inventive in terms of its plotting and characterization. I cannot say I was overly thrilled with how the story ended, but I very much enjoyed reading this book and could not put it down. 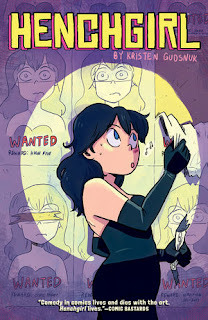 If you are looking for a fresh, funny, off-beat, and more feminine look at superheroics, this is the book for you. 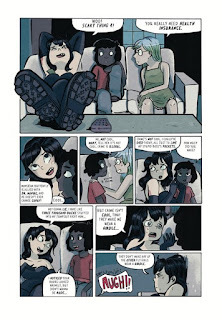 This comic was created by Kristen Gudsnuk, who uses a very cartoonish style that is charming but energetic. She also crams her backgrounds with lots of gags and details that highlight the story and add a touch of glee. She speaks about her work on Henchgirl in this interview. The reviews I have read of this volume have been positive. Dustin Cabeal wrote that "not only is this one of the best superhero comics I’ve read in many years, but it’s one of the best comic books I’ve ever read, period." 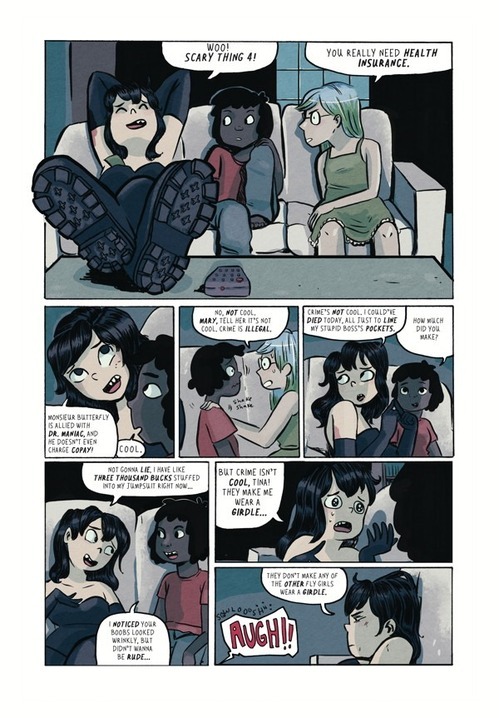 Publishers Weekly was more measured, stating that the opening chapters "of Henchgirl, drawn in a charming style somewhere between Scott Pilgrim and Steven Universe, have a delightful and spontaneous energy, but as the series progresses, Gudsnuk begins stitching her ideas into a narrative and things slow down a bit from the sparkling opening." Travis Pelkie summed up, "So if you’re looking for a book set in a superhero world where the real story is how a young woman finds her place in life, try Henchgirl." 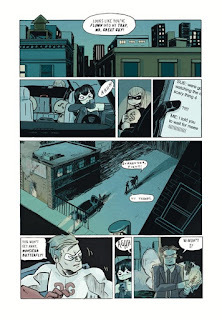 Henchgirl was published by Dark Horse, and they have a preview and more info about it here.